Two bedroom suites in Ploenchit are not easy to find, but the Centre Point Ploenchit Hotel has a good selection of two and three bedroom suites available. If you get in early there are great deals to be had as the rooms often feature great discounts from the normal rates. Share with another couple, if you don't have a large family and make staying in Bangkok that much more affordable. Enjoy a Thai welcome at the Centre Point Ploenchit Hotel. It is centrally located just up Wireless Road off the main Sukhumvit Road in Bangkok and comes with a choice of two or three bedroom suites to suit any family size. 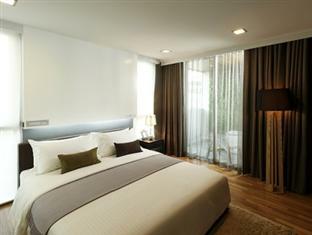 You will be located just 400m from Ploenchit BTS skytrain station, with easy access to the many attractions in Bangkok. If you are looking for somewhere to stay in Bangkok with room for all the family, then check out the Centre Point Ploenchit Hotel.